‘Sayonara’ is a simple music player (manager). I came across it few months ago when it was still at its alpha stage, but even back then I was impressed by its simplicity and low memory consumption. However the recent beta versions used as much as twice the memory it needed previously, its system tray icon did not work for me from the beginning and it used to keep playing for few more seconds from the background, even after closing. But yesterday ‘Lucio’ (developer) released it officially and I’m happy to say that within a very short period he has been able to fix a lot of bugs. The system tray icon is now working, the excessive memory consumption has been reduced and I loaded a couple hundreds of audio files into it and Sayonara used about 65MB when running. Did the same to Rhythmbox and it used about 49MB. Sure Rhythmbox is still a bit lightweight, but when considering some of its features, I really love Sayonara. And to be fare, in its early days it used even less memory (very similar to Rhythmbox). It comes with a simple interface, dynamic playlist support, a built in Equalizer, audio tag editing support, lyrics fetching, cover-art downloading, two themes and few other options. Loads really fast too. You can simplify the interface to look even more minimalist (as shown in the below screenshot) and where Rthythmbox failed to show the album-covers of some files, Sayonara had no issue showing them either. In Ubuntu, the menu is still located at its window rather than on the top panel and sometimes sub menus items stopped working. But it should be fixed in the future and according to ‘Lucio’ the memory consumption might also be reduced even more. I don’t know what Ubuntu versions are supported by the official release but I used it in Ubuntu 12.04 without any issues. If interested please visit this Sayonara home page and get it. It has packages for both 32 bit and 64 bit versions. Good luck. 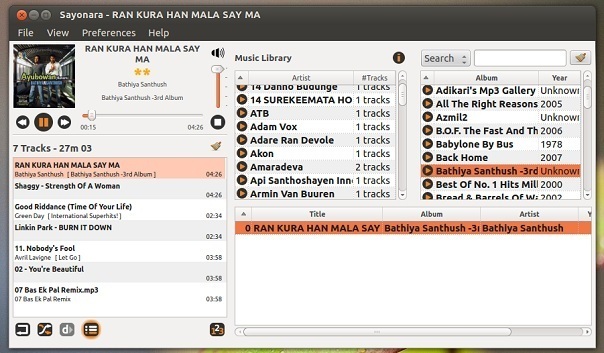 I use Ubuntu 12.04 and Sayonara don’t play m3u pls files from streaming. Thr developer must to find a free forum hosting for testers. In case you do not have a google account you also can write me an email. You can find the adress on the sayonara home page. Maybe you can append a link to this suspicious m3u file.